For Suppressor Project results, see: Suppressors and Shooting Range Structures. For brief results, see the Suppressor Project Summary. Except rifles and pistols, also suppressed shotguns were measured in the Suppressor Project. 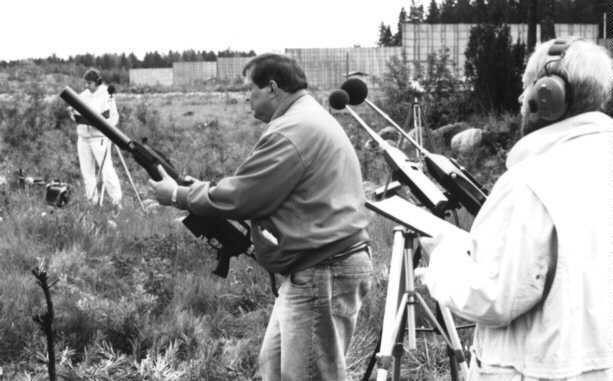 The sound level meters are arranged at about half a dozen points around the shooter to measure both noise level exposure to shooting range neighbours and to the shooter's hearing. 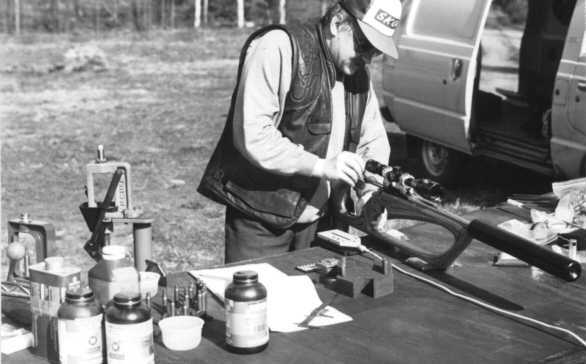 This photo is from Lahti shooting range, and the shotgun being carried to measuring stand is SPAS15 with an XRS Reflex Suppressor. 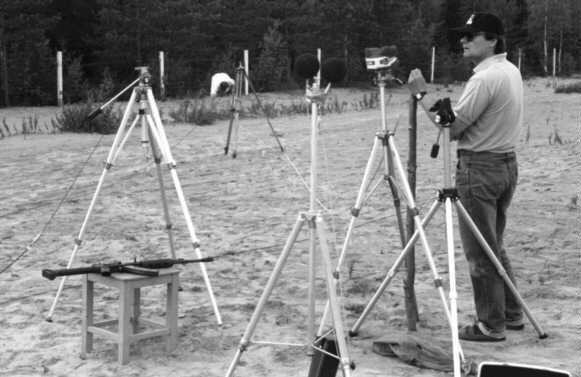 One of the points of measuring shotgun noise levels was to find an alternate to having to build noise shields to shotgun shooting ranges, like those seen in the background. 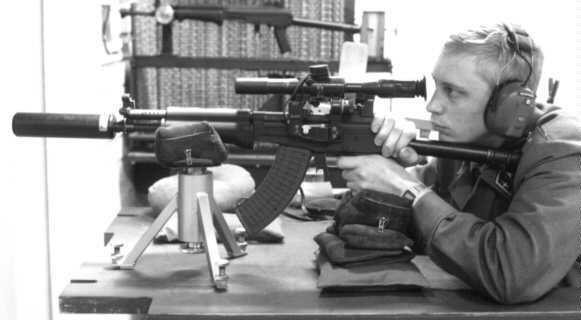 It was also noted, that the plain feeding cycle noise of a self-loading rifle can reach marginal peak levels, like with this M62 assault rifle. For the same rifle, unsuppressed and suppressed noise levels with both standard and subsonic ammo had already earlier been measured as a directional diagram. Suppressor effect on accuracy of a variety of.308 rifles was tested from Lapua Cartridge Factory machine rest in an indoor test shooting range. 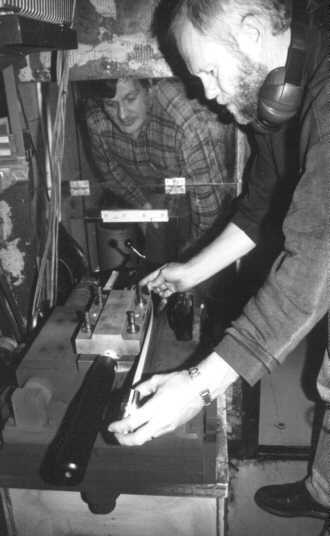 Chief Engineer Ilkka Kyttälä of Ministy of Labour, director of the Suppressor Project, checking length of a T8 Scout. See .308 measured and Suppressor Trials 1999. 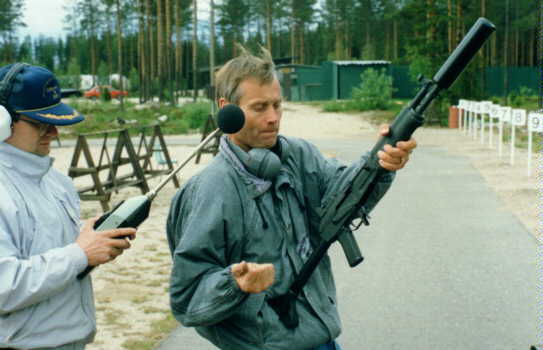 Professionals were needed also for testing a variety of suppressors for M62 assault rifle, regarding their effect on accuracy and impact shift.. 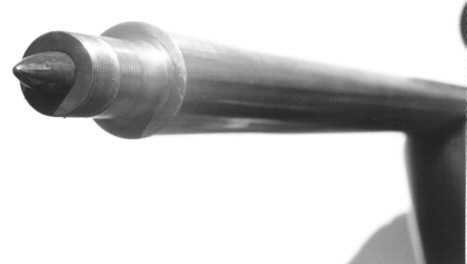 Shift of group center with plain barrel, flash hider and suppressors of different sizes and weights was shot from benchrest (above). Accuracy test was made from machine rest. To see resulting impact shifts, click Impact shift diagram. Dr. Rauno Pääkkönen conducting research among sound meter jungle in Lapua. In this event, different methods of shooting noise measuring procedures were compared for finding simple means of measuring shooting noise. For noise exposure to neighbours of a shooting range, a position at 10 meters right to the side of a firearm was found a good average from different directions and distances compared. Shooter's noise exposure was quite logically measured from beside his ear. See Suppressors and Shooting Range Structures for more information. Every .308 cartridge was handloaded prior to each shot for measuring bullet flight sound. A T8 Scout suppressor is attached to a BR varmint rifle. Sound meter remote readout and loading equipment are shown beside the rifle. Contrary to previous belief it was found, that in practise the speed of sound (Mach 1) was not any sudden threshold to sonic crack. In fact, the flight noise level started to rise from about 310 m/s and continued to rise all the way through the Mach 1 of 340 m/s up to 400 m/s, after which it leveled (see the diagram about resulting bullet flight noise ). Results of these as well as of other Suppressor Project experiments are published in Alan C. Paulson's book Silencer History and Performance, Vol. 1, and in Rauno Pääkkönen's and Ilkka Kyttälä's book Aseiden vaimentimet ja ampumaratarakenteet. See also an article about "How to Handload Subsonic Cartridges" from Gunwriters on the Web magazine by P. T. Kekkonen. Measuring the slowest subsonic .308 loads was tricky. The flight path became so curved with the slowest bullets, that they started to scratch the diffuser stands of a speed meter situated downrange, and eventually one bullet hit the screen! Luckily, a precaution had been made by putting double acryl shields in front of the screen, and the meter itself was saved (although shocked, maybe)! 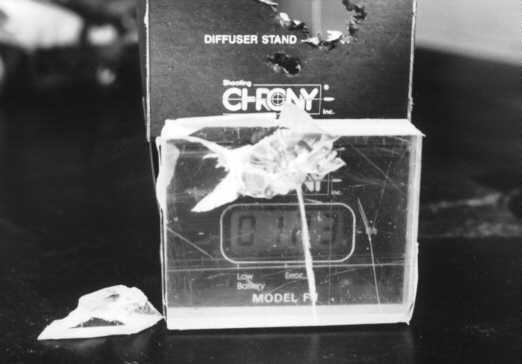 The speed dispersion of ultra slow .308 loads with jacketed bullets was high because of the minimum amount of powder in a large volume .308 case. One of the shots did not produce any speed readings, and it was very quiet also. After removing the suppressor, a curious sight was seen in the muzzle: The Slowest Bullet Ever was still hesitating its Giant Leap for the Wisdom of Mankind. Finally, it was carefully snapped out of the muzzle with a cleaning rod, and the test was continued. Aseiden vaimentimet ja ampumaratarakenteet by Suppressor Project leaders Ilkka Kyttälä and Rauno Pääkkönen. Silencer History and Performance, Vol. 1 by Alan C. Paulson. Alternate purchasing addresses: Amazon, Spytech.